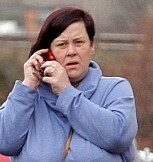 A randy nurse who slapped a colleague’s bottom and asked her if she would like his “sausage” has been struck off. David Robertson was sacked after lifting up his colleague’s uniform, repeatedly touching her without permission and slapping and kicking her across the hip and bottom. His lewd actions – which amounted to “serious sexual misconduct” – left his junior colleague feeling “uneasy” and “uncomfortable”. Senior charge nurse Robertson admitted the charges and claimed he was trying to “lighten the mood” at Woodside Court Care Home in Glenrothes, Scotland. But at a hearing in Edinburgh the Nursing and Midwifery Council panel found that his fitness to practice was impaired. Robertson subjected his colleague to a vile tirade of unwanted sexually suggestive advances, including touching her bottom and asking her “how would you like my sausage?” in front of stunned fellow medical workers. Robertson also lifted up her top to above her stomach and told the traumatised nurse she was “a bit podgy” and described her stretch marks as “still raw”. He then kicked the colleague’s bottom and described it as “wobbly”, which caused the woman to flee the room in tears. The incidents were investigated at the home but Robertson insisted the offences were just “banter” and said he was trying to create a good atmosphere. He later accepted all of the charges and informed the panel that he had not practiced as a nurse since the allegations and had no intention of returning to the profession. Reporting their findings, the panel said: “Mr Robertson abused his position as the senior charge nurse so as to humiliate Colleague A in front of other colleagues and sometimes in front of service users. “Mr Robertson acted without any regard for the distress that he was causing colleague A on a number of different occasions which culminated in him kicking colleague A’s bottom.